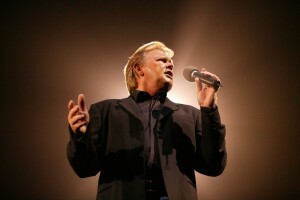 A month on from revealing a series of live dates at wineries across the country as part of the 15th Anniversary edition of A Day On The Green, Aussie icon John Farnham has confirmed a special one-off show to farewell Sydney’s Qantas Credit Union Arena. According to publicists, the singer holds the record for most performances at the venue, with the just-announced show in mid-December taking the number to 76, including 40 solo shows. Even the venue’s VIP Function Room bares his name, having been named after him back in 2002. “I’ve been playing the Arena for over 30 years now and they’ve been some of my most fun and memorable shows. I can’t wait to get back and raise the roof one last time – get ready for one hell of a farewell party,” the singer said in a statement. Daryl Braithwaite and Ross Wilson & The Peaceniks will join John in support for the one-off show, tickets for which are on sale from 10am on Monday August 24.